Burlington High School Principal's Blog: Dhliwayo and Aguilar Named All-State Artists! Dhliwayo and Aguilar Named All-State Artists! 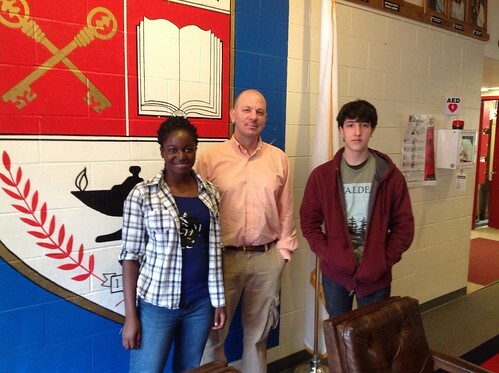 Congratulations to juniors Gamuchirai Dhliwayo (left) and Pablo Aguilar (right), pictured above with BHS Art Department Head George Ratkevich, for their acceptance to the Massachusetts Art Education Association's Art All-State Program for 2012. The art teachers who interviewed the students from across the state were impressed both wuth the students nominated and with the overwhelming support for the concept of Art All-State to rise annually. Unfortunately, we once more will be forced to turn away many deserving candidates. Labels: Burliington High School News, Burlington High School Art Dept. We are so proud of you. Throughout the years, I have used some of your work in my foreign language in-school field trip to the BHS Museum of Art in both the lower and upper libraries. You both have a tremendous amount of talent and expression. My sister, an alumna of BHS, credits her artistic talents both professionally and creatively to BHS Art Dept. From there she went on to Mass. College of Art and did very well! !